Tone 6 calls us into a Rhythm and Flow of Movement. Today is the Final Day of Spiritual Growth in the 260-day round of the Tzolk’in. This is a Day of Peak Energy when we are called to engage the full momentum of our Will toward a Divine Intention to be Reborn as a Being of Higher Consciousness. This is the Day the Chick makes the Choice to Crack through the Egg, to break it’s way to a new Realm of Experience. Reed/BEN represents the Channel though which our Spirits are Connected to the Divine. A Channel is Open for us to connect to the Source of Divine Consciousness. Reed/BEN is the Day Sign of Family and Home. Days led by Reed were set aside for Blessing and Repairing the Home. Road/EB was the day for bringing ourselves into Right Relationship with One Another and the Natural World. Through a Divine Communication, Reed/BEN will re-establish our position in a Divine Family. On Tone 6 we are intended to apply ourselves in an effort of Peak Performance. This is a day to engage everything we’ve learned in our Highest Effort of Consciousness. Through Reed, our Consciousness is Connected to the One Divine Consciousness, the Whole of a Divine Family. Reed/BEN shows us the way. The energetic of Tone 6 is compared to a great athlete. In the Dance of Life, we’ve been applying all our effort to learning the steps, the Choices, and Intentions that promise a Life of Meaning, Purpose, and Happiness. In the 13th Uinal of Ascension, Tone 6 marks the Time and Place of an Initiation. We no longer have to watch our feet. All the techniques have been honed and proven by Truth. Today we can break out in our own Dance, no longer just steps, but now performed as an Expression of Art by our Spirit. “There are many ways to accomplish the same thing,” say the Elders. The Whole of the Tzolk’in presents 13 Intentions of Movement… 13 Proven and Worthy Choices we can make at any time. 13 represents the 13 major joints in the Human Body – 13 different ways we move. The 20 Day Signs, or Daykeepers, reflect 20 different Divine Perspectives, through the Personalities of the Archetypes or Nuhals… 20 Different WAYS to Accomplish our Transformation to a Divine Consciousness. We can count our fingers and toes the “many ways we can accomplish the same thing.” The Tzolk’in is the calendar of Human’s Divine Transformation. In 260 days we learn 20 different ways to accomplish our 13 Highest Intentions. A Sacred Calendar presents them all in a Divine Order. As I began my own dedicated daily practice of following the calendar, I sought to Know these 20 personalities as the characteristics of a Divine Spirit that I could connect to through an effort of Consciousness. I invested an equal practice of honoring every Kin on each of the 260 days. My first round was an important Initiation in Knowing them all. A channel opened after my first 260 days. The great effort it took to understand and draw on Divine Inspiration made a breakthrough. Inspiration for the journal suddenly became easier. Today I received WordPress notification that yesterday was my 1,000th post. I Acknowledge the Synchronicity with this time and place of our Transformation. Looking back to where I began in October 2015, I see the proof of my own Transformation. I had nothing to live for. I saw the rest of my life as holding no potential for a meaning or purpose. All the hope was lost in Choices that bound me to the consequences of my past. All I could see was a lifetime of missed opportunities, because I was somehow Humanly incapable to grasp them. This journal was the last ditch effort. When I gave up on my life ever amounting to anything, I was Drawn by a Divine Intervention… an Inspiration to give everything I could give to a Divine Effort of my own Recreation. Today I have everything worth living for – a Meaning and Purpose more important that the circumstances of my life in the world Below. I see the world as only an Illusion veiling a Higher Truth. My life makes sense and, through Higher Conscioiusness, I can see I’ve gained the Wisdom of Human Experience from which to draw the Truth of Divine Justice. The past I once knew no longer holds Authority as a stronghold over my own Happiness. 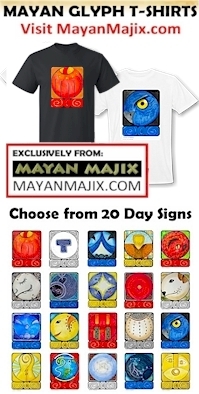 Today, the 20 Day Signs inspire me every day… no longer confined to their own day. They are all One in a Whole Body of Consciousness. On any day I can remember to Fly with the Eagle and look to my future, or Walk With the Ancestors who guide the Way of Forgiveness. As we draw closer to our own Divine Consciousness we can Know the Truth that as Sparks of the Creator, so do we have 20 Divine Aspects to our own Divine Personality. So do we have 13 Divine Movements of Creation. Our first day of Ascension in the 13th Uinal of Ascension was 13 Deer/MANIK. We Ascended to our Highest Identity of Meaning and Purpose. We were born to Serve One Another as the Hand of the Creator. As the Keeper of Spiritual Tools, we Ascended to a new Wisdom of Spirit holding every Choice and the Many Ways to be Transformed by engaging the Divine Perspectives of our Spiritual Identity. The Star/LAMAT trecena guides an Application of Spirit. We are called to the Dance of our Life by the Creator that holds the Way to Multiply everything we focus on to Abundance. The Way of Reed/BEN is symbolized on the glyph as an Altar. Above are the channels through which Human is connected to the “Light of Inspiration.” They don’t reach all the way down, illustrating that as Human we are unable to see the Full Light of the Creator from Below. The Unconditional Love and the Spiritual Gifts of the Creator will always be Greater than can be conceived by the Human mind. Below, the glyph illustrates the prayer mats, the place where Human would kneel in Humility. We draw the Light of the Creator when we Acknowledge that the Light of our own Consciousness is not our own, but the Spark of a Divine Creator. As Human, there is no way we could earn the Spiritual Gifts we are given. The gifts are an Inheritance for Being the Firstborn Child of the Creator. Reed/BEN reminds us that Humanity was the Creation of a Divine Family. Under the direction of a Supreme Creator, holding the Intention of Harmony and Equity, each family member holds the position of the Scion of a Divine Creator. A scion is defined as the first descendant or offshoot. We are as cuttings from the same Holy Vine, planted on Mother Earth to Grow in the Image of the Source of Who We Are. To all my relations, may we invest the Whole of our Consciousness in an Intention to Know the Truth of our own Heritage. May we Acknowledge that all the Divine Aspects of a Supreme Lord of Creation reside within our own Spiritual Identity. When our Choices are Correspondent with a Divine Way, we will reflect the Image of the Creator. Our own Identity will be a portal for a Breakthrough of Divine Light. May we consider the “magic” that Human was able to Conceive and Birth a calendar of Divine Transformation. May we consider all the Conscious Thought that was invested and the Truths that were brought together, not from one Human, but from the Whole of our Collective Consciousness. May we Honor our Divine Destiny was to share the Experience of our Transformation with the Whole of the Consciousness of Humanity. Together, through an application of Consciousness, our Higher Thoughts are the Light we Draw Together to Free us from the Gravity of the world that would hold us down. We are Born to Fly, Born to Dance through Life on the Wings of Spirit. As we make our Final Step to the Place of Divine Balance, may we Acknowledge the Wings we were given as the Proof that a Higher Meaning and Purpose is waiting for us beyond the shell, Believing in the thinness of the veil that separates us from a new and Higher Consciousness of Being. May we Believe in our own Spiritual Power to Break Through by a Human Declaration of Humility. May we imagine the Miracle that waits on the other side Multiply to Abundance. May we remember our Greatest Effort of Spirit is a Human Surrender and that each of our Lives holds the Promise of a Divine Meaning and Purpose. NOTE: As I looked for yesterday’s count on the 21 days of gratitude, I discovered I “forgot” to post my Gratitude yesterday on Road/EB (Human). In synchronicity with Road/EB (Human), it reminded me that Human’s Greatest Challenge is just to Remember. I’m grateful that all Human needs to do to be Transformed is to Remember to Live in Consciousness of our own Divine Spirit. I’m grateful for the Divine Intervention that helps us Remember. Congratulations on hitting 1,000 posts. That’s pure dedication. This was so inspiring to read, as usual. 1000 posts is amazing. Here’s to another 1000 because I hope you’ll never stop! So grateful for your wisdom. 😂 I am so happy for the new life that has come to you in the last years. I have wanted to tell you for some time now that YOUR POSTS ARE THE MOST IMPORTANT AND HEART FILLED JOY THAT I GET EVERY DAY❤️. I look forward to reading these. A wise friend, Patrick, gave this present to me and I got to be with you for a whole round (260). You are very special. When you write about what has happened to you it seems so relevant. What a special life we get to live with each other.